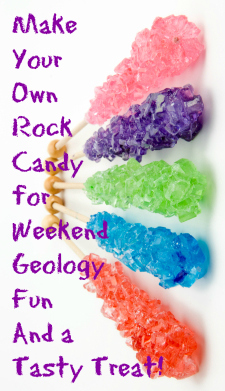 Parents and children can have a fun time together growing rock candy sugar crystals. Making your own rock candy is great summer science and it makes a wonderful sweet treat too! SAFETY FIRST! Please get an adult to help boil and handle the water and scissors. Do not spill sugar on the burner as it can cause a flame. Step 1: Have an adult place the water in a sauce pan and heat over medium. Sugar will dissolved more easily if the water is boiling or almost boiling. Stir sugar into the water ¼ C at a time. Completely dissolve the sugar into the water each time. You will know that the sugar is dissolved if the solution is clear and no crystals remain. If you see sugar crystals in the bottom of your pan that will not dissolve then you have saturated your water. Set the pan aside to cool while you prepare the jar and string. Step 2: Tie a piece of string to a pencil and hang the string in the glass jar. If your string is not rough, have an adult fray the string slightly with scissors. Rest the pencil across the top of your jar and tape it in place if necessary. Make sure that the string does not touch the bottom or sides of the jar. Step 3: Once the sugar solution has cooled for 10-15 minutes pour the solution into the glass jar. Cover lightly with a tissue and place the jar in a cool location out of the way. Step 4: Leave the string in place over night for small crystals. Leave the string in place for several days or weeks to grow large crystals. Sugar crystals grow best in a cool location with low humidity. Do not move the jar or remove the string often because it can slow the crystal growth. Check your crystals daily. Document your experiment in your notebook each day with notes, drawings and/or photos. We would love to see photos of your crystals!